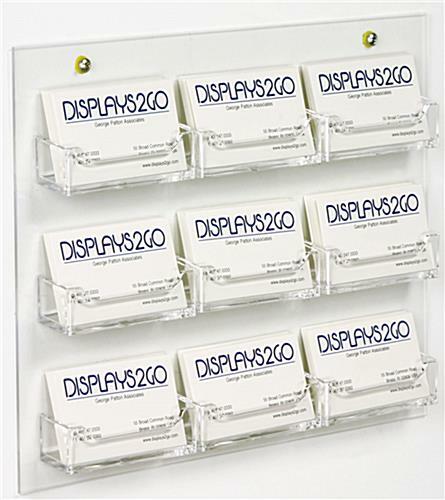 This wall mounted business contacts display promotes goods and services in an office or retail showroom, freeing up counters and floors. 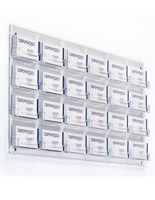 Nine pockets give the user plenty of slots to store and dispense product or company information. 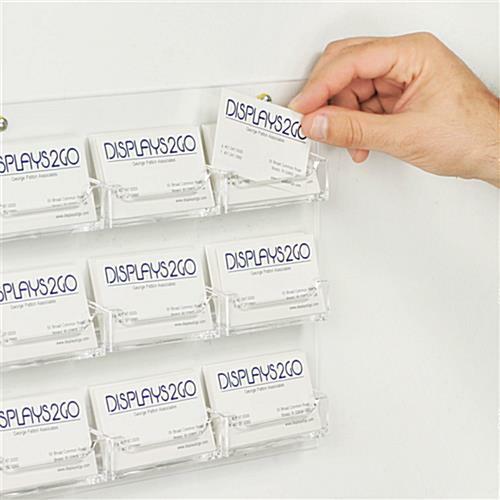 Typically seen distributing credentials at automobile dealerships, eateries, convenience stores, and more, these acrylic card holders showcase multiple merchants’ phone numbers and addresses in an attractive wall case. 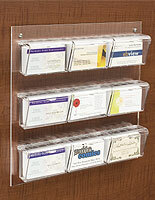 This business contacts display, also known as a business info dispenser, is constructed of inexpensive plastic with a slight blue tint, hardly discernable from expensive conventional glass. With nine people in the office, each having their own court job specialty, we wanted the public to be able to contact the correct individual to take care of their needs. 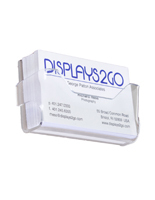 Having this product puts all of our business cards in a central location and makes it easy to grab the correct persons card to give to the public. That is perfect! We're glad that we had our 9-pocket business card holder is making it easier to share the court's contact info with the public. Thank you for the excellent review, Charlottesville Circuit Court! 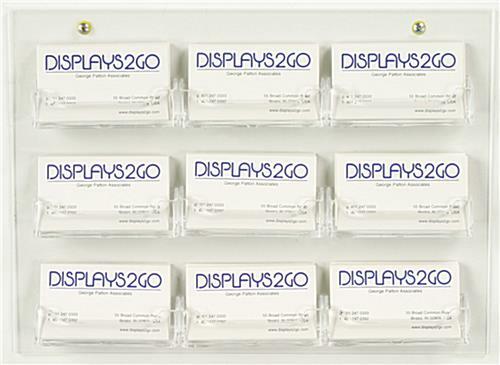 We hope you'll continue to use Displays2go for your office's display needs. The product is great! The prior order had small break on one of the items. It was immediately handled by the staff and they took great care of me to get it corrected. 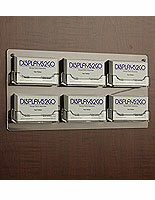 THANKS Displays2Go! You ROCK! We're so happy to hear that our customer care team took such good care of you, Carrie! We're so happy that you love your product and appreciate the great review! Good quality for a good price. 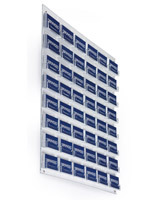 Lightweight, easy to install, looks good on light colored painted wall and on textured, darker one. Perfect For Our Medical Practice!! Due to an expansion of our practice, we were no longer able to fit all of our doctors' names on our appointment cards. Now that we have a separate card for each doctor, we needed an out-of-the-way solution for displaying and holding our appointment cards. The 9 packet card holder was the perfect solution. They are very durable and have a high quality appearance. 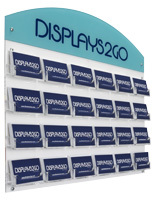 We will look to displays2go first for all of our display needs! These look great, Dan! Thank you so much for the rave review and sharing this photo with us! We're so excited to work with you again in the future. 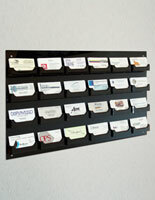 We needed to get our business cards off of the sales counter where they were CONSTANTLY in the way...ENTER THE SOLUTION! 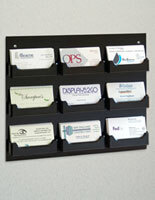 The wall hanging business card holder is the perfect size for our application. We purchased two of the units and mounted them on a narrow cabinet out of the way. THANK YOU! We're so glad we were able to help you clear up some counter space, Chris! Thanks so much for the review and sharing the photo with us!